Argon - Welcome to the Paha Sapa Grotto! Argon (Ar) makes up 1.3% of our atmosphere by weight and 0.934 % by volume. It can also be found everywhere dispersed through the pore space of rocks within the earth's interior. Although held tightly within defects and holes within crystal lattices, it is released during heating events, and being a gas, will eventually make it way to the atmosphere. A major portion of the terrestrial pool of argon has been produced since the Earth's formation from the radioactive decay of the tiny amounts of the isotope potassium-40 (40-K = 0.012% of all potassium) found within potassium bearing minerals. Measuring the production of argon-40 (40-Ar) from the decay of 40-K is one of the more commonly used methods for determining the Earth's age (potassium-argon dating). Argon (Ar) is the most abundant of the inert Noble gases within our atmosphere. It is a colorless, odorless, non-reactive gas that is the 3rd to 4th most abundant gas (Ar vs. H2O) in the air that we breath and the atmospheres of caves. Although atmospheric argon is ultimately derived from the decay of radioactive 40-K, it is not measurably radioactive itself and consists of just 3 stable isotopes. Radiogenic (but not radioactive) 40-Ar is by far the most abundant (99.60%) of argon's natural isotopes. Neither 36-Ar nor 38-Ar is radiogenic, so their abundances and isotopic ratios are thought to represent primordial values that haven't changed since the formation of the solar system and the earth. These two stable isotopes are typically compared against the abundance of 40-Ar to yield information on the ages of the rocks and solutions that argon has had exchanges with along its flow path. Argon is also one of the densest of the atmospheric gases. It has a density of 1.78 kg/m3 , which is just 10% less than that of carbon dioxide (1.98 kg/m3). Carbon dioxide readily accumulates and often displays pronounced seasonal variations in cave air concentration and distribution. Argon (Ar) is the most abundant of the heavier-than-air gasses found in cave atmospheres, and like CO2 and radon (Rn), it should have the potential to accumulate in areas with restricted air flow. Argon's density is among the highest and it's rate of diffusion the lowest of all the principal gases in cave atmospheres, so it seems logical that it may have the tendency to accumulate. Argon has a very low rate of diffusion, which is the primary factor for predicting gas accumulation. 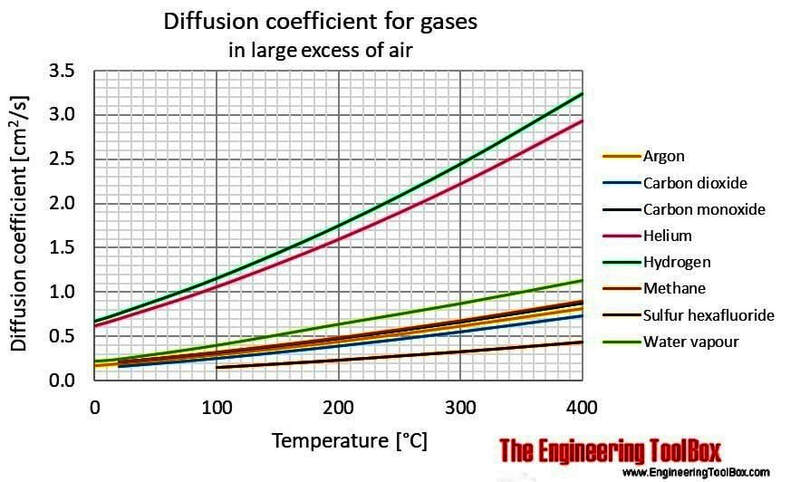 Gaseous rates of diffusion are compared by their respective diffusion coefficients. Assuming an average cave temperature of 10C (50F), argon's diffusion coefficient is 0.173 cm2/s, which is only 18% higher than that of CO2 (0.147 cm2/s). Overall, it is the third lowest after radon (0.104 cm2/s) amongst common cave-air gases. Under the right conditions, therefore, argon (Ar) should accumulate in much the same way as does it's far less abundant noble gas cousin, radon (Rn) and/or carbon dioxide (CO2). Under which conditions that might be, however, has not been widely studied or recognized. ; it should be, in my opinion. Why? Because argon is the most abundant of the non-reactive noble gases present in cave atmospheres. Many of the noble gases (argon included) have been used as geochemical tracers of both aqueous and gaseous solutions in non-spelean environments, and these types of solutions are key participants in the formation and development of karst and caves. A few speculations as to the conditions under which argon (Ar) enrichment might occur would perhaps be germane at this juncture. The potential for accumulation is likely to be highest in low spots with restricted ventilation, as this is observed with the other heavy gasses, and there is no reason to suggest that this is not the case with Argon, as well. High gaseous concentrations of 40-Ar might be reasonable to expected in caves when there is potassium (K) rich bedrock either stratigraphically below the cave or nearby. Gaseous enrichment is also possible where cave networks intersect an argon saturated water table or where hypogene groundwaters such as thermal or other solute/gas enriched solutions are known or suspected to be involved in the speleogenetic process. Argon’s chemical and isotopic properties make it an ideal tracer of Earth processes. There is a considerable amount of information that argon isotopic compositions and concentrations can provide if the time and effort are put forth to acquire and assess them. Noble gases like argon (Ar), helium (He), neon, (Ne), krypton (Kr) and xenon (Xe) are chemically inert and many of the complications that are common in interpreting isotopic data in other methodologies are absent when working with such tracers. The patterns of noble gas isotopic variation are directly related to the source area and formations from which the gas originated and the path that it has taken prior to it's final destination. This is true of both the anhydrous gases contained in the pore spaces of formations and those that are dissolved in groundwater. Although virtually all of the geochemical research done on argon isotopic variation has been done on groundwater, it should also be applicable to the argon that finds its way into cave air from formation gas sources. The patterns of Helium (He) and Argon (Ar) isotopic variation have been most widely studied, but Neon (Ne) Xenon (Xe) and Krypton (Kr) have more recently been looked at, as well. Argon's abundance, however, makes it far easier to evaluated than most of the other noble gases. Argon gas has about the same solubility in water as oxygen and thus can be readily dissolved in aqueous solutions. When surface precipitation enters the groundwater regime, it is generally saturated with argon and takes on its atmospheric isotopic signature. The natural variation in Argon's three stable isotopes has been used to determine the paleo-recharge temperature of groundwater. The dependence of argon's solubility on temperature makes it possible to determine the recharge temperature of recent and paleo-groundwater by simply evaluating the total dissolved argon gas content and comparing it against it's solubility limits as a function of temperature. The assumption in this method is that the water does not pick up any additional argon along the flow path. Often enough, however, there are potassium mineral bearing lithologies within the aquifer. When there is dilution from additional argon, it is most likely to be due to radiogenic 40-Ar produced from reactions with these potassium bearing minerals within the rock matrix along the flow path (see below). If the flow path for groundwater is dominantly through carbonates, however, argon dilution is less likely to be as prevalent, and in karst aquifers, flow paths restricted to carbonates is generally the case. The half life of 37-Ar is only 35 days and that for 39-Ar is 269 years, so the later is used in most age estimations. Age dating using the 39-Ar abundance is possible out to about 2000 years or so (~7 half lives). They can also be produced, under the right conditions, from in-situ reactions within the rock matrix through which the groundwater flows. The presence of uranium or thorium in the rock matrix is the primary cause of this type of interference. In general, only minimal interference from the in-situ reactions listed above occurs for the 39-Ar reaction, whereas the 37-Ar reaction is often masked by interference and this is most particularly the case in Ca rich matrices (like limestone!). This interference, however, can yield some fairly useful information (see next section). The n(40Ar)/n(36Ar) ratio has also been used to aid in groundwater dating. This ratio has a constant value in the atmosphere as a whole of 295.5, but in groundwater, higher ratios are often the case. The groundwater n(40Ar)/n(36Ar) ratio of a given source can be substantially compromised by the addition of radiogenic 40-Ar from nearby potassium rich lithologies. This source of contamination comes from rocks that are not within the aquifer itself but which are producing argon that has migrated into the system from nearby areas. Because of the short half life of 37-Ar, groundwater has virtually no cosmogenically produced 37-Ar present. However, subsurface production of this isotope is common from rock matrix reactions involving the trace uranium and thorium found in many minerals. By measuring the amount of 37-Ar present, the production rate within an aquifer or formation can be assessed, the neutron flux level can be thereby deduced, and the efficiency of mineral to water transfer of Argon estimated. All of these values are essential for defining how the other radon isotopes may be used and interpreted in hydrologic and spelean applications. 39-Ar has been mainly used in dating groundwater in conjunction with the usage of other isotopic methods. With a half life of 269 years, age determinations using 39-Ar overlap with the high end of the tritium range (3-H), and the low end of the carbon-14 (14-C) range. The 39-Ar method is most useful for dating young (~40 to ~2000 years B.P.) groundwater, and this is generally the age range most applicable to speleogenetic processes, as well. Even though argon is one of the four most abundant components of cave air, it's variability in abundance and distribution within spelean environments is essentially an unknown. To the best of my ability to ascertain, it has not been studied in cave environments to date. 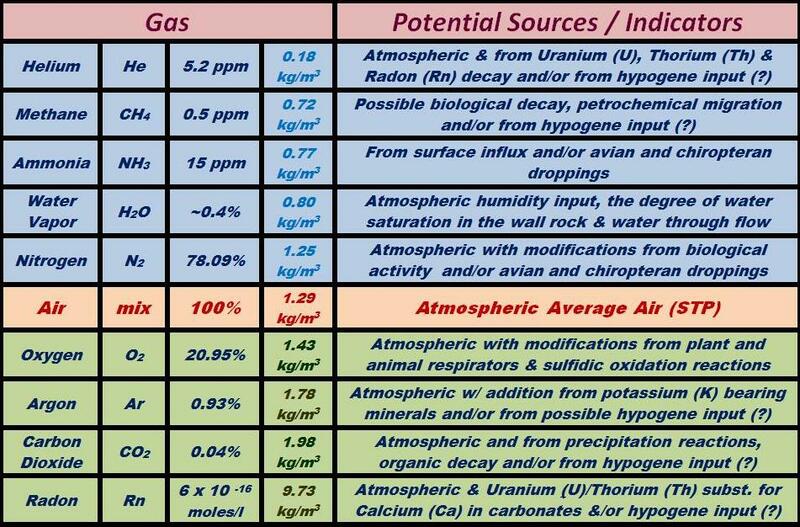 Argon is a heavier than air gas that should have the the potential to locally accumulate, very much like CO2 and it's radioactive noble gas cousin radon (Rn). This gas should therefore be subject to variability in concentration and distribution due to oscillations in cave air dynamics. Like radon, argon bears a radiogenic isotopic signature and has be used successfully as a tracer of geochemical processes within lithologic and hydrologic systems. By inference , argon should also be useful as a tracer of these processes as they are uniquely expressed in cave environments. A systematic look at argon abundances and isotopic patterns within cave air and waters would seem overdue, but as a geochemist who is also a caver, that's just might be my personal bias shining through. So be it. "the eternal recurrence of the same"